Toyohara Kunichika (1835-1900) Shiragikumaru Raising a Monument, 1869. Oban. This is a fantastic Kunichika… I am assuming that the figure pictured, in the process of raising a gigantic temple bell from the depths of the river, is from a strange and moving story of homosexual love - an unusual subject in ukiyo-e. Nonetheless, the love-suicide of Shiragikumaru was well known and also the subject of a popular kabuki drama. Shiragikumaru is the young acolyte and lover of the temple priest Jikyu. Unable to live with the harassment of the other priests they resolve to commit suicide in the sea at Enoshima. Jikyu survives the fall to the sea, but seventeen years later, when called upon to minister to the Princess Sakura, he finds that she is the the reincarnation of his young lover. The androgynous character in Kuniyoshi’s print is the young acolyte Shiragikumaru raising a monument (in the shape of a bell) to the lost site of the temple at Enoshima. The white chrysanthemums of the poem are an allusion here - in Japanese they are spelt shira-giku, an obvious pun - visible as the flowers coiled around the bell. The curious and lurid flame on the left of the print is the conventional signifier of a supernatural occurrence. 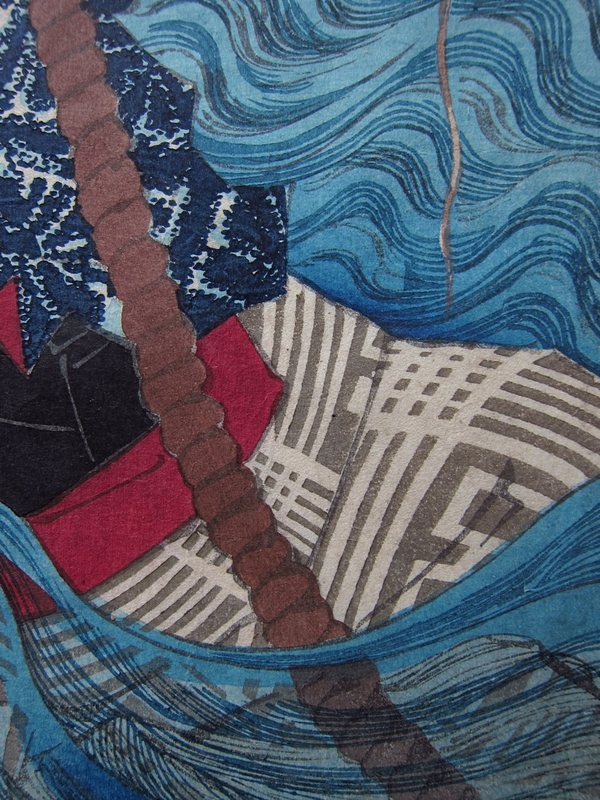 Nevertheless, the print is very nice indeed… the colour scheme is rich and unusually full, the weight of the bell is nicely realised and the figure rises out of the confusion of the waves, the water and the decorative fabric. Colour, condition and impression are all excellent. 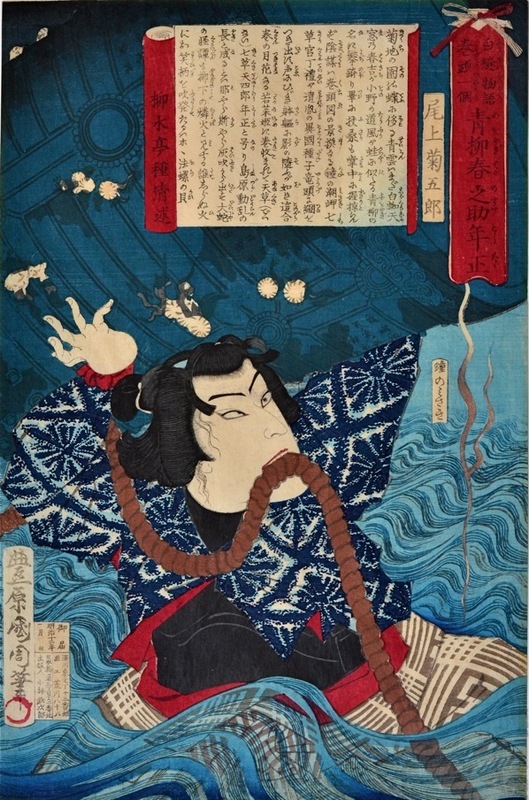 Kuniyoshi used this subject in one of his prints for the series A Comparison of the Ogura One Hundred Poets.